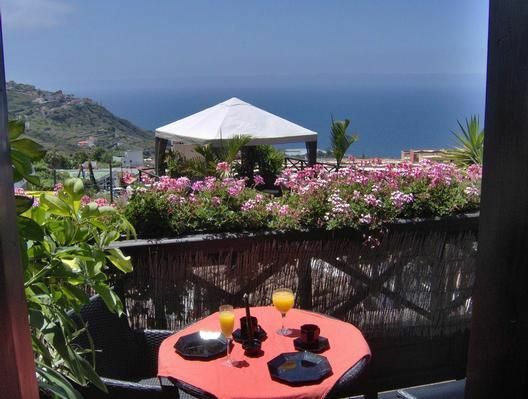 These smart rural apartments are in a 200 years old monastery building with typical patio, rambled stairs and a big sun terrace with excellent views to the mountains and the Atlantic ocean. The house is an example of Canarian architecture. It was completely renewed by the year 2010, conserving his original Canarian style. The mostly young and international guests are using the Apartamentos San Antonio as perfect starting point for mountain bike and walking tours as well as for trips around the varied areas of the island. Apartments San Antonio are located next to the city of Icod de los Vinos surrounded by palms and green environ, aprox. 325 meters over the Atlantic ocean. The famous dragontree and the city center are aprox. 800 meters away. Nearby there is also one of the biggest volcanic caves of the world (the Cueva del Viento). The next beach (the Playa de San Marcos) with several bars and restaurants is only 3.5 km away. Equipment The Resort has got 6 apartments, one studio and a nice big roof terrace with views over valley and sea. Every apartment has got one bedroom, a living room, bathroom and a kitchen or kitchenette. The kitchen includes toaster, espresso maker, soap, and other utensils for daily use. A safe in every apartment is free and beach clothes for our guests also (deposit). Apartment 7 - Atico with private balcony and sea view: Modern living in a rustic atmosphere. Our atico on the top floor offers great views of the Atlantic. This modern apartment has a generous plan living room, a well-equipped kitchen, a bedroom with double bed (150 cm) and a bathroom with bidet and a two person shower with seat. From the private balcony you got a panoramic view of the sea and the mountains. Of course, the large communal terrace can be used too. SAT-TV or local TV. - Late check-in (after 21:00h): once per object Costs amounting to 20 EUR (Mandatory).